It gives me special pleasure o introduce Dr. ABE's doctoral dissertation on the Sankhepatthajotani, which is now being published in the Bhandarkar Oriental Series, for, I know very well the amount of time and travail which its preparation has entailed. I still remember how, a few years ago, a shy young man from Japan came over to the Bhandarkar Oriental Research Institute for a deeper study of Pali Buddhism; how, by his affability, keenness, and diligence, he soon endeared himself to the academic and administrative staff of the Institute; how he strove tenaciously to get over the many Initial difficulties which he had to encounter; and how, having once found his tune, he finally exerted all his strength to complete successfully the task which he had set himself. That was Jion ABE! ABE was, no doubt, exceedingly fortunate to have received throughout his studies the solicitous help and expert guidance of such an eminent Budhologist as Professor P.V. But I can vouch for the fact that ABE too did not shirk making great demands on himself in order to be able to conform to the schedule and standards set by his teachers. Poona, it may be recalled, is one of the two centres in India (the other being Calcutta) where regular study of Pali and Buddhism, at different levels, was started for the first time in the modern period. The work of the late Professor Dharmananda Kosa MBI in that connection was, indeed, of a pioneering character. He may be said to have initiated a distinguished tradition in that field. It has been the constant endeavour of the Bhandarkar Institute not only to maintain that tradition but also to augment it in every possible manner. Many scholars from Japan, senior and junior, have come to the Institute for the study of and research in Buddhism and have thereby actively fostered the Institute's efforts in the direction. I am glad that Dr. ABE has now qualified himself to be counted among such scholars I also feel sure that, apart from his study of Pali Buddhism and related subjects, his fairly long stay in India has enabled him to acquire first-hand knowledge of various aspects of Indian life and culture. This is bound to prove great asset in his future career. This book represents the results of my study of Buddhaghosa's Visuddhimagga and its commentaries, especially the Silaniddesa (I) and the Dhutanganiddesa (II). It is generally admitted that the Visudhimagga is the most authoritative text for the study of Pali Buddhism. It consists of twenty-three chapters, of which chapters I-II discuss "sila". III-XIII "samadhi", and XIV-XXIII "panna". The Visuddhimagga has three well-known commentaries, Dhamapala's Paramatthamanjusa (Mahatika), Chapada ("da)'s Visudhimaggaganthi, and the Sankhepatthajotani (Cullatika), a work of unknown authorship. Of these the Sankhepatthajotani alone is yet to be published. Following a suggestion of Prof. P.V. Bapat, I went to Thailand in April of 1975 and again in 1977 to examine a MS. of the Sankhepatthajotani preserved in the National Library, Bangkok, and was allowed by the same Library to make a microfilm copy. To my knowledge, a similar MS. has not been found in Srilanka, Burma, or elsewhere. The main body of this book is an introduction to the Sankhepatthajotani and a critical edition of its first and second chapters. The importance of the text lies in the fact that it records views which differ those found in the other two commentaries In the Introduction, I first present the Mss. 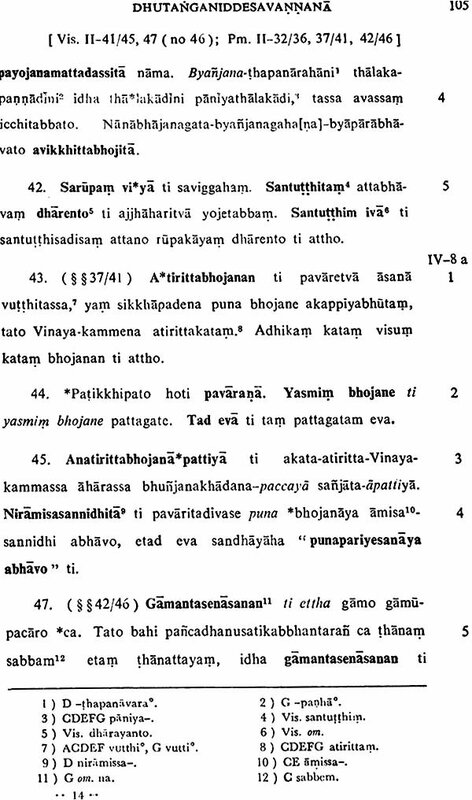 of the Sankhepattajotani as a Pali source for the study of the Visuddhimagga. 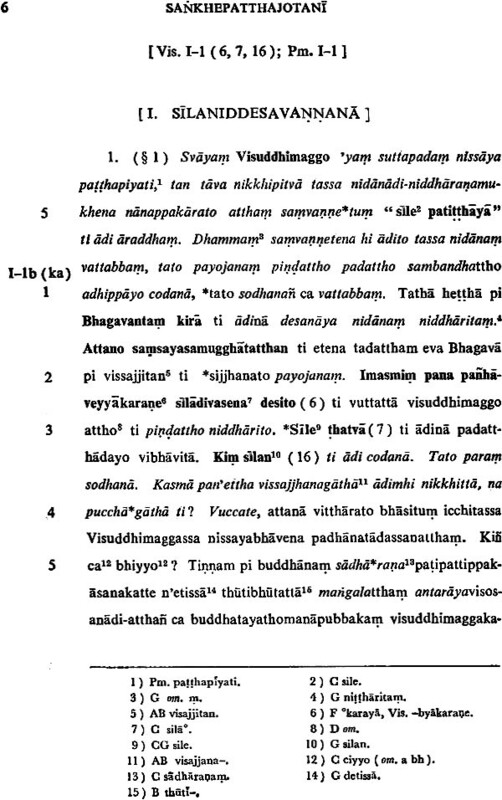 Then I discuss the date and place of the Composition of this text, and compare its content with that of the Paramatthamanjusa.Next I point out the new views found in this text on such subjects as "athanga" and "sattanagaraparikkhara", and compare them with the various views of the Nikayas and other commentaries. In parts 2 and 3, I clarify the meaning of the words "sila" and "dhutanga" which form the main subjects of the first and second chapters of the Visuddhimagga. Lastly, I discuss how Buddhaghosa and Dhammapala criticized the Abhayagiri Schools's view of " dhutanga". 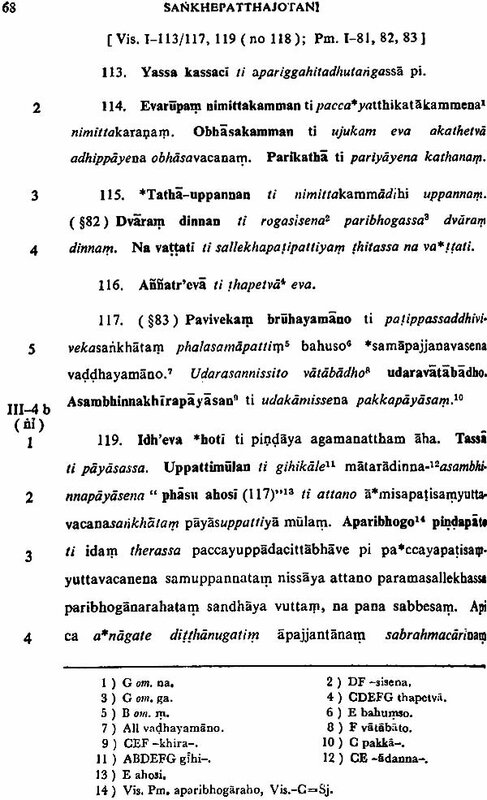 I have added as appendices lists of the Pail texts quoted in the Visuddhimagga and the passages from the Pali texts in the first and second chapters of the Sankhepatthajotani. I have also added a comparative table listing the HOS edition of the Visuddhimagga with the corresponding pages of the PTS edition of the same book and the paragraph or folio numbers of the three commentaries including the Sankhepatthajotani. This should provide the reader with a cross-reference guide for comparing the contents of the editions of the Visuddhimagga and its commentaries. This book provides only a beginning to the study of the Sankhepatthajotani. The task of critically editing the remaining chapters, a complete translation and index still remains to be done. The author sincerely hopes, however, that this small book will give some help to scholars studying the Visuddhimagga. It is my pleasure to express my gratitude to those who have helped me in many ways toward the completion of this book. I have first to express my profound indebtedness to Profound indebtedness to Prof. Dr. P.V. Bapat, who has been my teacher in the study of Pali Buddhism and the doctrines of the Visuddhimagga since November of 1974 when I first came to Poona. He was also kind enough to read through the first draft of this book, and his suggestions were of great value in its revision. I have also to express my sincere thanks to Prof. A.M. Ghatage, Prof. S.D. Joshi, Prof. A. Hirakawa, Prof. K. Takasaki, and Prof. J. Takasaki, all of whom encouraged me throughout my doctoral studies. Prof. R.N. Dandekar has earned my deep gratitude for encouraging me in the study of Pali Buddhism and by kindly offering to write the Foreward to this book. I must also acknowledge the kindness and good offices of Mr. B.N. Paranjape and Mr. V.L. Manjul (M.A.) of the Bhandarkar O.R. Institute. I am also very thankful to Prof.V.V. Gokhale, the late Prof. P.L. Vaidya, and Prof. H. Nakamura who all encouraged me in a personal way and contributed to my overall understanding of the Buddhist tradition. I must also mention my feeling of gratitude to Prof. Dr. K. Mizuno, who first initiated me into field of Buddhist studies. In completing this book, I have received the help of many other persons, too numerous to mention; to them also grateful. Finally, the author must express his thanks to the Authorities of the National Library, Bangkok, and his gratitude to Prof. Dandekar, Mr. Paranjape, and Mr. E.R. walvekar and his staff at the Bhandarkar Press, for all their help in bringing the publication and printing of this book to successful completion. The dimensions show 'length of a leaf'', 'width at middle', and 'width at ends'. About the volume, we have two kinds of Sj-Ms., namely, a twenty-four volume MS. (A MS. etc.) and a twenty-three volume one (B MS., etc.) Each volume consists of 24 folios. The total number of folios is 561. However, the 24th vol. of A (and K) consists of only 9 folios, but the 23rd vol. of B (and H, I. J) consists of 33 folios. So the total number of folios of A and B is the same. Of these Mss. only A and B are complete. C and E have only the first 12 vols., and D and F have only the first 11. On the other hand, II,I, J, and K have the latter half only. G has the first 21 vols., and not the rest. The leaves of the 10th and 11th vols. of E are somewhat damaged. The editors names appear as Rama I to V of the Bangkok Kingdom, Thailand. The reign of each is; Rama I (1782-1809), Rama III (1824-51), Rama IV (1851-68), and Rama V (1868-1910). The Rama II edition of Sj. is no longer available. The number of lines in each folio is 5. The folio is written in the Cambodian (Khmer) script. The numbering proceeds duodecimally on reverse-side of each folio as follows: The first and second chapters of Sj. continue into sixteenth folio of the vol. 4, "ji", in other worlds they fill three and two-third volumes. The total number of folios is 87 and a half. A has been taken as the basic MS. in this critical edition, with B,C,D,E,F, and G being compared against it. G especially has many mistakes and omitted words or syllables. 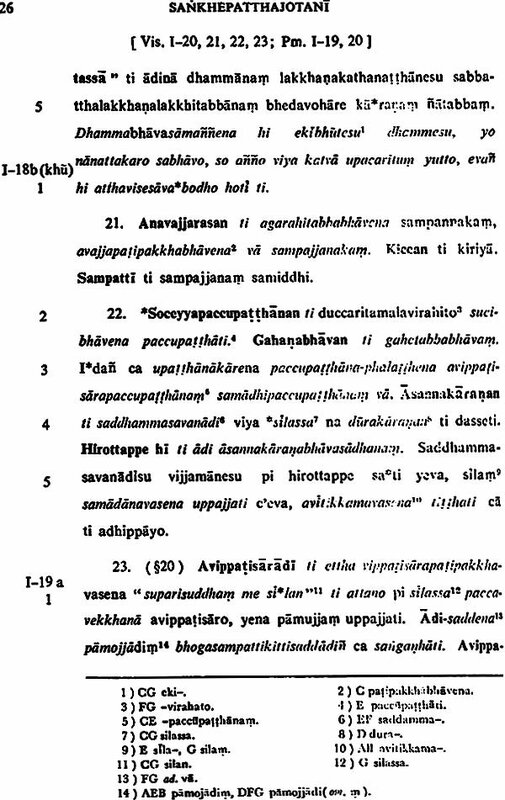 In editing the text, I have noted all variants, even though some of them obviously scribal errors. (b) The Composition of Sj. Sj. is the Cullatika of Vis. It is clear that Sj. was composed in order to supplement Pm., the Mahatika of Vis. From this gatha it is not clear who wrote the text, and when or where it was written. It is also not clear at whose instance it was composed. Even the closing gatha does not mention anything about this. However, Gv. gives us a clue. Gv. 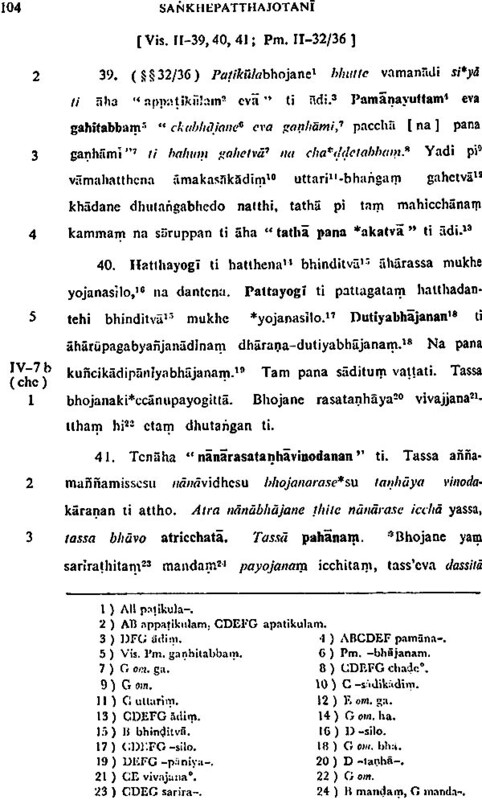 says "Visudhimaggacullatika" (p. 62), but does not supply an individual name such as "Paramatthamanjusa", "Sankhepatthajotani", etc. So it is certain ie the text referred to in Gv. is the same as our text Sj. or not. If it is, we can say that Sj. was composed before the 16th cent. A.D. because Gv. was composed in the same century. Furthermore, Gv. says that twenty texts including Ganthi. 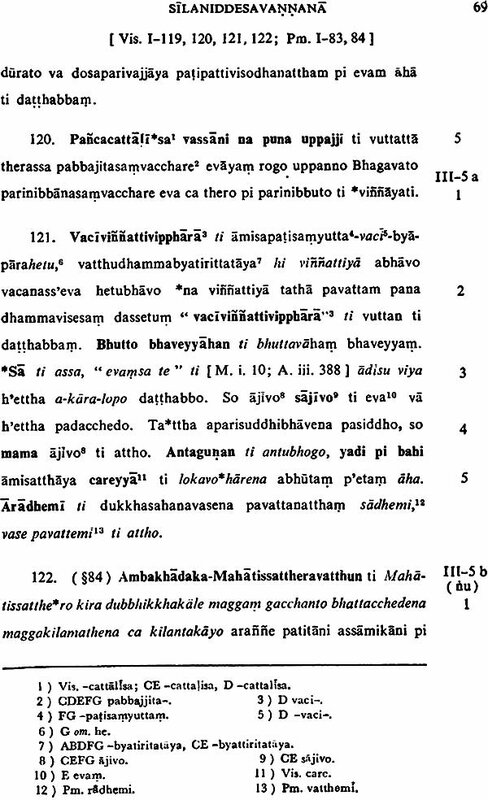 and "Visuddhimaggacullatika" were composed by twenty Acariyas (p.62). Ganthi. was written by Chapada who stayed in Ceylon from 1170 to 1180 A. D. according to W. Geiger. If this correct, Sj. was composed at the same time or at a time later than the composition of Ganthi. From this evidence I feel that the date of the composition of Sj. be somewhere from the 13th to 15th cent. Further, Gv. 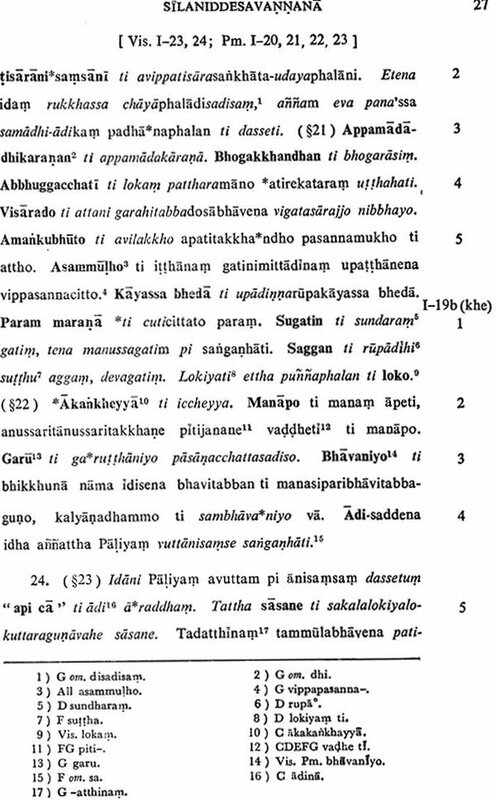 says that those twenty Acariyas are from Ceylon (p.67). So, following this reference of Gv., the author of Sj. would be a Ceylonese. Regarding the place of the composition of Sj., the worlds in which Vis. is quoted in Sj. are almost the same as those of the Sinhalese edition of Vis. Therefore, it can be said that the author of Sj. commented on Vis. by using the above edition. Also, we come across the words "Anuradhapura" and "Abhayagiri" in Sj., which are place and school names in Ceylon, but not in "Abhayagiri" in Sj., which are place and school names Ceylon, but not in Thailand, or elsewhere We may, for these reasons, assume that Sj. was composed in Ceylon. However, the passage "Svatti namo Buddhassa" is found in all the Mss. of sj. at the beginning of the text (Sj. I-al). 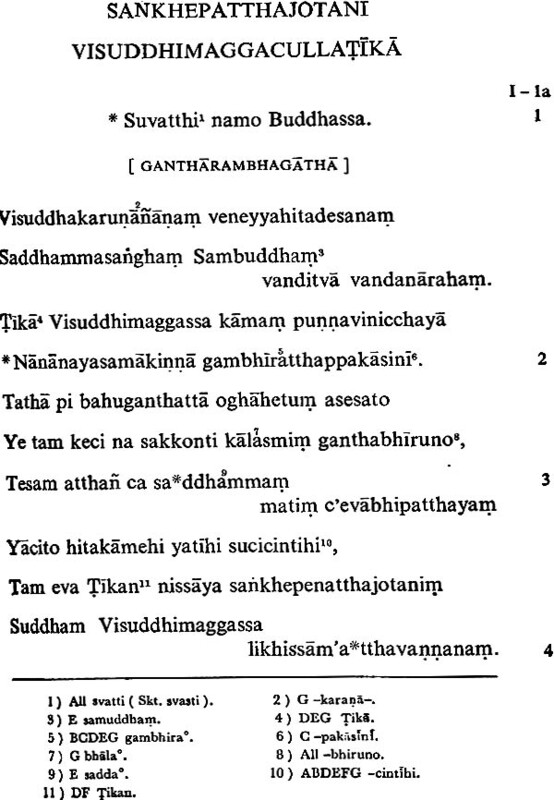 Usually the passage "Namo tassa Bhagavato Arahato Sammasambuddhassa" is used as the opening Benediction in the texts composed in Ceylon or Burma. Furthermore, the word "svatti" (or svaddi, SKt. svasti) is often used in Thailand, Cambodia, and Laos. The word "svatti" itself is not a regular Pall word The word corresponding to the Sanskrit "svasti" should be 'sotthi' or "suvatthi". So we may conclude from this that the text was composed in the area of Thailand or Cambodia, but not in Ceylon or Burma. Of course, we can think that the word "svatti" or the Passage "Svatti namo Buddhassa" may have been added later. Therefore, we cannot say clearly whether Sj. composed in Ceylon or in the area of Thailand and Cambodia, but can only conclude that the text was composed in one place or the other. More detailed and minute studies on Sj. will be necessary to decide the date and place of the composition on Sj. will be necessary to decide the date and place of the composition of Sj. (c) The Relation of Sj. to Pm. As mentioned above, Sj. is a commentary which follows the Commentary Pm. and was composed in order to supplement it. However, it is not a direct commentary (i.e. Anutika) of Pm., but like the latter it is considered a Tika. Therefore, Pm. is called the Mahatika (Big Commentary) of Vis., and Sj., is the Cullatika (Small Commentary) of the same. Abridgements of many passages from Pm. appear in Sj. as Pm. is a very detailed composition and sometimes has lengthy explanations. For that reason the text was named "Sankhepatthajotani" (which means 'the abridged explanation of the meaning of the meaning of the Visuddhimagga'). However, Sj. is not a mere digest of Pm. It has many words and passages which are not commented on in Pm., and also has several fresh views. It is in this aspect that we will consider the importance of Sj. Furthermore, as far the first two chapters are concerned, Ganthi. has no similarity with Pm. and Sj. at all. we can see the relation between Pm. and Sj. in the following examples. To being with, Upatissa, the author of Vim., re-arranges the portions of this passage into 'eight ways' (pa hsing). Dhammapala also arranges them into atthangas, and gives his own view and that of Mahasiva There in Pm. (I-70). Sj. introduces a new view of 'some people' (kect) after having shown the two views mentioned in Pm. Buddhaghosa arranges them into thirteen or twelve padas, but does not sdjust them to the eight ways. Ganthi. has done neither. 2 The Meaning of the Word "sila"